SAN BERNARDINO, CA -- A San Bernardino County, California, sheriff's detective lost his finger during an attempt to save his K9 partner, trained in explosive detection and tracking, who died while searching a warehouse, officials said Friday. 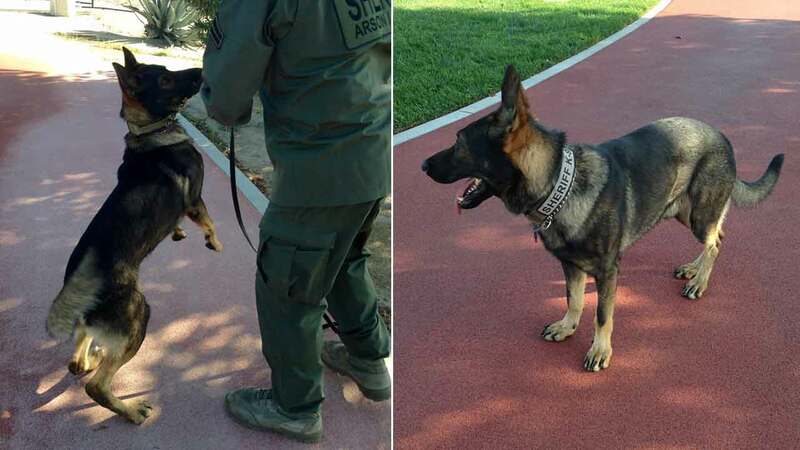 Jojo, a 4-year-old Sable German Shepherd from the Czech Republic, got an object lodged in his throat and choked to death during the exercise on Jan. 6, according to the San Bernardino County Sheriff's Department. Jojo's handler, Detective Brad Phillips, posted a message on the department's Facebook page on his attempt to rescue his friend and partner of three years. "I did everything in my power to save him and in the process had my right pinky finger amputated...I am devastated that I failed," he said. Unknown whether doctors will be able to reattach his finger, Phillips said that loss is a "small price to pay" in an attempt to save his partner's life. JoJo was assigned to the bomb and arson detail with tracking and explosive detection skills. He was the only K9 trained in his field in San Bernardino County, which is the largest geographical county in the U.S.
Phillips said although Jojo accomplished many things throughout his career, including finding buried guns and tracking wanted felons, his most courageous moment was on Dec. 2, when he searched neighboring buildings, parking lots and the very site of the San Bernardino terror attack for 10 consecutive hours while "people were still lying lifelessly." Following the attacks that left 14 people and 22 injured, Jojo cleared the venue before President Barack Obama arrived to speak to the victims' families. Phillips, who has served as a deputy sheriff for 26 years, said he and his partner spent 24 hours a day, 7 days a week together while on duty and at home. "At times we traveled 500 miles to conduct searches but neither Jojo nor I minded because we had each other. We depended on each other for safety, comfort, and companionship," he said in the post Friday. The heartbroken detective said Jojo was "remarkable" as he loved and cared for his family, especially his 11-year-old daughter. He concluded by saying his partner and friend "will be greatly missed."